MONTEBELLO >> Details slowly continued to emerge over the weekend after a U.S. Drug Enforcement Administration agent shot and wounded an unarmed suspect as he fled from a Montebello home Friday afternoon. DEA special agents were teamed with Los Angeles County sheriff’s deputies when the shooting took place about 1:50 p.m. Friday behind a home in the 700 block of Carmelita Place, according to DEA and sheriff’s officials. “The special agents were conducting a narcotics investigation and were in the process of contacting the occupants of a residence when several individuals ran out the back of the house,” Lt. John Corina of the Sheriff’s Homicide Bureau said in a written statement. The suspect was struck once by gunfire and was taken to a hospital where he was expected to survive, Corina said. “A gun was not recovered from the scene, but the investigation is ongoing,” the lieutenant said. Sheriff’s officials withheld the suspect’s name, and it was unclear if he was to face any charges. No further details were released Sunday. As in all Los Angeles County officer-involved shootings, a parallel investigation is also being carried out by the Los Angeles County District Attorney’s Office, officials said. 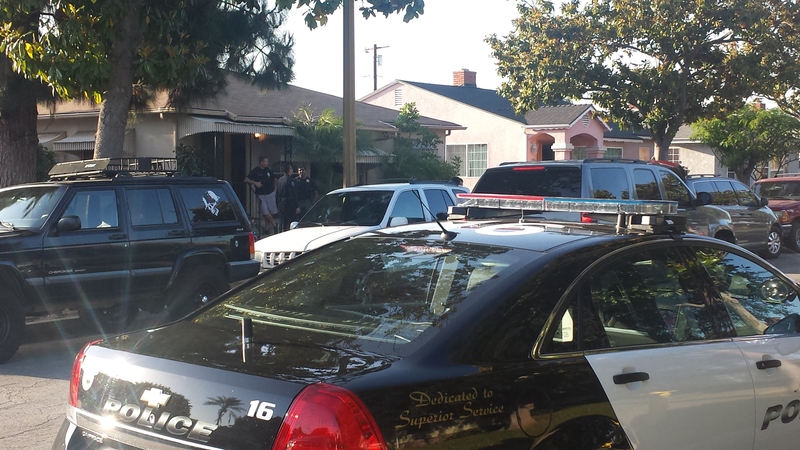 MONTEBELLO >> A U.S. Drug Enforcement Administration agent shot and wounded a suspect at a Montebello home Friday afternoon, authorities said. Little information was initially released regarding the officer-involved shooting, which was reported at 1:47 p.m. in the 700 block of Carmelita Place, Deputy Amber Smith of the Los Angeles County Sheriff’s Headquarters Bureau said. No information regarding the condition of the suspect was released Friday evening. There were no initial reports of any injuries to law enforcement officers. “A Drug Enforcement Administration agent was involved in a shooting at a residence in Montebello, California, during a joint narcotics enforcement operation with our local counterparts,” DEA Special Agent Vijay Rathi said. Rathi deferred all further comment to the sheriff’s department, which is spearheading the investigation. Sheriff’s detectives routinely assist Montebello police in investigating officer-involved shootings in their jurisdiction. Dozens of DEA, Montebello police and sheriff’s officials responded both to to the scene of the shooting at a beige, single-story home, and at a large command post set up around the corner at a Montebello Unified School District facility. ST. LOUIS — Police and sheriff’s departments in states that produce much of the nation’s methamphetamine have made a sudden retreat in the war on meth, at times virtually abandoning pursuit of the drug because they can no longer afford to clean up the toxic waste generated by labs. Despite abundant evidence that the meth trade is flourishing, many law enforcement agencies have called off tactics that have been used for years to confront drug makers: sending agents undercover, conducting door-to-door investigations and setting up stakeouts at pharmacies to catch people buying large amounts of cold medicine. The steep cutbacks began after the federal government in February canceled a program that provided millions of dollars to help local agencies dispose of seized labs. Since then, an Associated Press analysis shows, the number of labs seized has plummeted by a third in some key meth-producing states and two-thirds in at least one, Alabama. The trend is almost certain to continue unless more states find a way to replace the federal money or to conduct cheaper cleanups. In Michigan, authorities still bust meth labs when they find them, but tougher missions like secretly sending officers into the meth underworld have been scrapped. Authorities say they have no doubt that meth trafficking remains brisk. Record busts are being reported in some states that fund their own cleanups. But in places that rely on federal money, law enforcement agencies feel paralyzed. At least one sheriff became so frustrated that he considered burning meth waste illegally in a landfill rather than leaving it in neighborhoods where curious children could find it. In Warren County, Tenn., about 70 miles southeast of Nashville, deputies had “always been very aggressive on meth,” Sheriff Jackie Matheny said. By midsummer a year ago, they had busted some 70 meth labs. This year, that number tumbled to 24. “When you have to kind of kick it into neutral, it makes you sick to your stomach because we know it’s out there,” Matheny said. Making matters worse, sheriffs say, was the suddenness of the loss, which didn’t give cash-strapped local governments any time to come up with another way to pay for cleanups that typically cost $2,500 to $5,000 per lab. The AP analysis involved building a database of lab seizures in the nation’s top 10 meth-producing states based on 2010 figures. Combined with numbers from the first half of 2011, the statistics showed that seizures had dropped sharply in states that depended on federal money. Yet busts were skyrocketing in states that pay for their own cleanups. The AP also conducted 50 to 60 interviews to confirm the trend, speaking with police officers, sheriffs and meth-lab specialists in many of the top 10 states. Lab seizures were down 32 percent through May 31 in Tennessee, which led the nation in seizures in 2010. The numbers were similar or worse in other leading meth states: down 33 percent in Arkansas, 35 percent in Michigan and 62 percent in Alabama. All of those states relied heavily on funding from the federal Community Oriented Policing Services, or COPS program. It offered local agencies $19.2 million in 2010. That money was not renewed and is unlikely to come back. Other figures confirm that meth is thriving. The most recent national survey from the Department of Health and Human Services shows that after declining for several years, the number of first-time meth users rose in 2009 to 154,000, up from 95,000 the previous year. The National Drug Intelligence Center reports that shipments of meth from Mexico are also on the rise. In states that have developed their own lab cleanup programs, full enforcement has continued. Missouri, the leader in meth lab busts for a decade before falling to No. 2 behind Tennessee last year, has seen a 9 percent increase in seizures through May 31. Kentucky seizures are up 34 percent, Illinois up 36 percent. Because meth is made using a volatile mix of ingredients such as battery acid, drain cleaner and ammonia, only crews with specialized training are allowed to handle the materials found in labs. The waste and debris cannot be dumped in a regular landfill, only in specially approved waste sites. In years past, a typical meth lab often consisted of pots of simmering chemicals in basements, kitchens and garages. But then restrictive new laws made it harder to purchase large quantities of the cold medicine pseudoephedrine, a key ingredient. That led many meth makers to give up on big batches in favor of smaller ones produced by combining ingredients in a 2-liter soda bottle. The majority of labs now use this “shake-and-bake” system, police say. Under the COPS program, the agency that seizes a lab notifies the Drug Enforcement Administration, which hires a contractor to clean up and remove the meth debris and take it to a disposal site. Those cleanups typically cost at least $2,500, even for a small shake-and-bake lab. Matheny’s office busted 100 meth labs last year. At $2,500 per lab, that would cost the county $250,000 — money he said the local government doesn’t have. Farmer recalled a conversation with another sheriff who was distressed about the cost of cleanups — and frustrated that there wasn’t a cheaper way. The sheriff’s response was that illegally disposing of the waste was a better alternative than leaving it in a neighborhood where kids might get into it. “He said, ‘I don’t have a choice,'” Farmer said. States are finding different ways to adapt to the loss of the federal money, but it has not been easy. Oklahoma was also among the national leaders in meth lab busts in 2010, when it used federal funds for cleanup. After that money dried up, the state agreed to pick up the tab. As a result, lab seizures in Oklahoma have continued to climb — up 25 percent this year. The decision was costly: Oklahoma had to scuttle plans to hire a combined 20 drug investigators and educators to pay the cleanup tab. “We stepped up and decided we had to do this,” said Mark Woodward, spokesman for the Oklahoma Bureau of Narcotics. In states with their own cleanup programs, local police and deputies are trained to remove meth waste and collect it in designated containers — essentially small metal storage buildings. The DEA picks up the waste and disposes of it. The system is far less expensive — $500 for a typical cleanup. Now some states that previously used the COPS money are developing their own container systems, including Michigan and Tennessee, which began its program last month. Arkansas also is looking at a container program. Meanwhile, states are aggressively pursuing legal means to stop meth before it is made, largely by limiting sales of cold and allergy pills containing pseudoephedrine. A number of states track pseudoephedrine purchases. In July, Mississippi began requiring a prescription for pseudoephedrine. Meth lab busts there fell 68 percent for the first five months of 2011, compared with the same period in 2010. More than two dozen towns and counties in Missouri have adopted their own prescription-only laws. Police chiefs and sheriffs agree the problem is too big to ignore. HOUSTON — Federal authorities are searching the Houston clinic of Michael Jackson’s doctor. KTRK-TV reported that officials with the Drug Enforcement Administration were at Dr. Conrad Murray’s clinic in north Houston. Video showed two Houston police officers guarding the front door. Murray was Michael Jackson’s personal physician, and was with Jackson when he died. Murray, who is based in Las Vegas and is licensed in California, Nevada and Texas, has been interviewed by police but he has not been considered a suspect in the singer’s death. Wednesday, along with two other people, at a home in West Covina.